Wow, August flew by way faster than I expected! Here we are at the end and I finally got around to uploading the monthly program. This months program, PAC-MAN Video, is a bit different. Although I call it a game, it doesnt really play like one. It is totally random with a slight nod to you. Skill isn't required, just give it a try. This game is actually born out of my brief time with teletype devices in school. I was in a 6th grade computer club and the computer teacher gave me a programming book to learn BASIC. I immediately went home and read how to do simple PRINT and INPUT statements on it. Since the teletype printer will only display a line at a time, most of my programs used just those two commands. 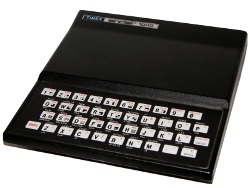 This program, one of my first on the ZX81, used the SCROLL command to mimic the line by line teletype output. I was using what I knew, and this program is born from that. Since I wrote this program in the early 80s, PAC-MAN was very popular and familiar to me then. For that reason, and that reason only, the name shows up in many of my programs. I tended to use the charters in my games, but they bared little to no resemblance to the real arcade game. This version mentions that it is a revised version of PAC-MAN Advanced but I havent found that game yet. The object of the game, and I hesitate to call it that, is to eat 50 dots. You can also eat prizes that show up along the way. Occasionally, the game will ask if you want to turn. If so, enter the letter M. The game is over if you run into ghost, of which two versions exist. The game is completely random. There is no skill involved and no way to avoid the ghosts. Turning doesnt do anything at all, it is just a way to make it feel like you are doing something. You arent. I apparently wrote this program before I understood game mechanics. I was learning to program and PAC-MAN Video was a step in my lifelong love of computers. Share with me your steps.